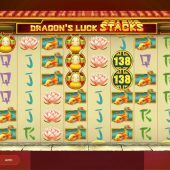 Dragon's Luck Stacks slot has a rather spectacular appearance and Red Tiger Gaming have firmly established themselves as popular developer, possibly as a result of Laser Fruit which could arguably be said is their equivalent of BTG's classic Bonanza slot. If you've played Red Tiger's Laser Fruit I'm sure that the first observation you'll have made is the reels here - you have a 6x10 grid which is the maximum you can achieve in that slot's free games. This is far simpler however with a Chinese theme as is common with Red Tiger and their customary sounds as the reels spin and stop. 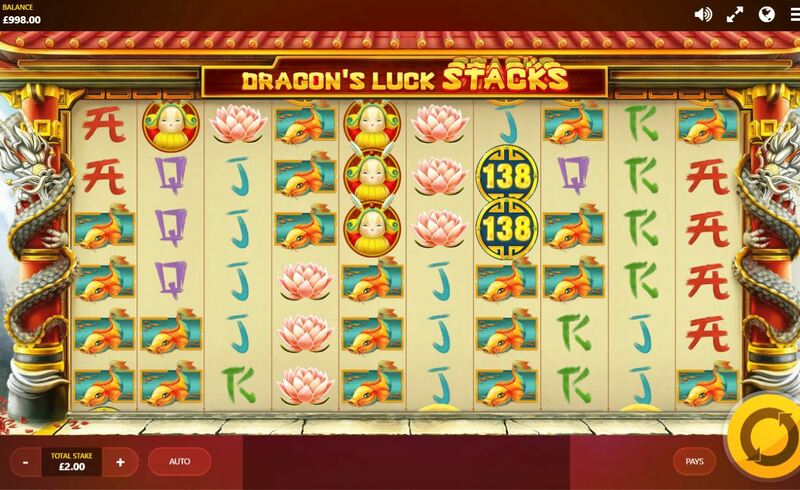 Can Dragons Luck Stacks increase your chip stacks though? All icons appear stacked up to the 6-row height of the 10 reels but despite the spectacular appearance we only have 30 paying lines although the minimum 3-of-a-kind (3OAK) needed for a win can occur anywhere on the grid to count as it's an 'adjacent pays' format. You pay 20 coins for the 30 lines so paytable awards are essentially 0.67x your coin stake so if you won an award paying say 100 coins you would win not 5x bet but 3.33x bet. Yes, it's odd but that's how they've done the rules! Anyway, you can win from 3 to 10-of-a-kind and rather than list all the pays it should suffice to say that the lowest of the five card values (10) pays 6 coins for 3 and 720 coins for 10 and the highest of the four picture symbols is the 138 icon which awards 30 and 3888 coins at the extremes. In terms you'll want to hear the full screen of the 138 will award 3,888x bet and it is doable when we see how the in-play feature works! So we know it's possible to win with 3 different ways on the same pay line, i.e. a 3OAK, 4OAK AND 3OAK and we are assisted in getting these pays by the Dragon Coin. It's a stacked Gold Coin icon which appears on all reels and reveals a mystery symbol which may or may not assist in creating a win when it appears fully or partly in view. The real booster is the Mega Coin as this is the same but will appear in any size from a simple 3x3 to the maximum 6x10 as the reels spin. If it lands anywhere in view, even with just one row of it visible it guarantees a win. If as is common it lands in a smaller size you may still have the normal stacks land next to it on other reels and they too will transform into the same icon. That's all folks, no random in-play features, no bonus round or free games.